The Signature Collection concept is one you'll love or hate, but there's no denying the quality of the plug-ins themselves. Instant gratification. Surprisingly flexible at times. Excellent Drums plug-in. Responsive metering. No gain reduction metering. Strings & Keys is hit and miss. Lack of in-depth control will annoy some. 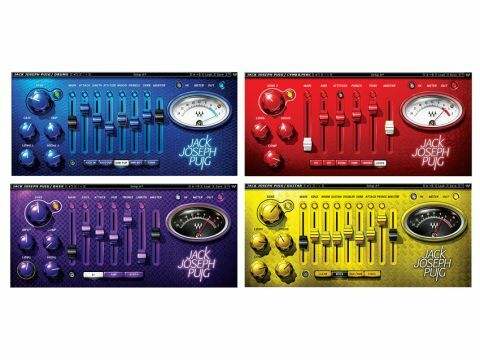 Jack Joseph Puig's first collaboration with Waves resulted in The Jack Joseph Puig Analog Legends bundle, which featured software recreations of some of his own personal vintage outboard gear. This latest effort sits alongside Waves' Tony Maserati and Eddie Kramer Signature Collection packages and includes six application-specific plug-ins that claim to give you JJP's signature sound. They're based on his outboard signal chains and are simply called JJP Bass, Drums, Strings & Keys, Cymbals & Percussion, Vocals and Guitars. The methodology here is pretty simple: grab the appropriate plug-in for your material, and you'll instantly get tailored processing (dynamics, EQ and effects) à la JJP. Stuffing all of that processing into one single-panel plug-in means that parameter control has been reduced. "When using the plug-ins, it's clear that there's lots going on that you simply cannot change." As standard across all six plug-ins, you get a main processing section on the left with low and high EQ and one-knob compression. Some have an extra knob - a de-esser on the Vocals plug-in, for example. Processing levels are influenced by the input Sensitivity control, with an amber LED that lights up to indicate a suitable level. Moving on, and the central fader bank dials in processes that are specific to each plug-in, such as transient enhancement, tailored EQ, further compression, exciter, delay, doubling and reverb. Rounding things off are a number of selectable instrument 'types'. These influence not only knob and fader positions, but in some cases the nature or even type of options included. For example, the Drums plug-in has options for kick in/out, snare top/bottom and toms, and your selection determines the reverb style - it's different for snare and toms, and unavailable for the kick drum. Complementing the type selector buttons are a set of presets, accessed from the Waves toolbar. All plug-ins come in mono-to-stereo and stereo formats, and Bass and Drums are also in mono. Of the mono-to-stereo plug-ins, all but the vocal and bass tools have a pan control. When mixing, a typical processing chain might involve EQ, compression and further dynamics such as gating or de-essing. The chances are you would then add effects such as auxiliary reverb and delay, and possibly split the channel to use further fancy tricks like parallel compression. To provide a one-stop solution in a single plug-in, Waves have used both serial and parallel signal processing. Given the 'black box' nature of the plug-ins included in the Signature Collections, it's arguable that there's no great advantage in knowing how the processing is carried out. However, the manuals clearly indicate how it works, and it's standard across the lot. If nothing else, it at least partly satisfies our gnawing curiosity. First up, the input signal is processed via the left-hand panel processors in series: compression, EQ and occasionally a little something extra. This signal is then fed via the main level fader to the master output fader. A pre-main fader split is then sent to the centre section processors, like an auxiliary send, and you blend these in using the faders. Rounding things off, you also get mutes for these as well as the main level fader. The concept is basically that of a mixer for sonic attributes. Now you know! The processing techniques encapsulated in these plug-ins must suit JJP's own working methods, which he's honed over two decades of mixing. So, let's summarise his aims. Drums is specifically for kick, snare and tom processing. With options including Attack, Wood and Length, the goal is snap and weight in equal measure. Cymbals & Percussion offers Punch, adding tight compression; Attitude for mid-range grit; and Amb (ambience) for high-end sparkle. Bass has synth and bass guitar options to deliver edgy mid-range (Edge and Attack) and rounded bottom (Sub). Guitars is better suited to rockin' electric tones than acoustic guitars. That said, the combination of Drive (Edge), EQ (Warm and Presence) and Width (Doubler and Verb) makes it a very flexible plug-in. Strings & Keys aims to deliver the width, space and radiance that's desirable on synths, strings and piano. Finally, Vocals includes the tools needed to help the vocal sit, and includes De-esser, Delay (Space) and enhanced Reverb (Magic) with two male and one female types. When using the plug-ins, it's clear that there's lots going on under the hood that you simply cannot change, and that lots of decisions have been made for you. However, the parallel nature of the signal flow means that you can mute all elements and listen to the processing one fader at a time, which is particularly illuminating given the stylised labelling. Some option names are descriptive enough that you'll quickly grasp what they do (Wood for snare drums, say) but some less so. Solo listening establishes that Vocals' Space setting is a short stereo slapback delay combined with a tempo-synced echo, and Magic is a preset-dependent enhanced reverb. However, understanding the inner workings isn't the best way to approach these plug-ins. We had most success when firing one up, selecting the appropriate instrument type and simply going to work. This worked particularly well with the Drums plug-in as the presets are so clear-cut, and adding attack, decay and presence are very typical processes. However, we struggled to get the right piano sound using the piano setting in Strings & Keys, as we couldn't adjust the EQ accurately enough. In some areas, we found the processing to be far more flexible than might be expected, such as with the Bass and Guitars plug-ins. Elsewhere, we found the processes offered by the central faders subtler and harder to distinguish - eg, the four options in Cymbals & Percussion. We were very impressed by the responsive metering, though an overall gain reduction option would have been a great addition. Overall, the cleverly combined processing works best when taking already good sounds to the next level. However, if you want to make detailed changes, you may be frustrated and end up using typical mixing plug-ins instead. You may find the eye-popping, candy-coloured livery a bit too much for an early morning or late night session, too. Grumbles aside, this bundle is reasonably priced (well, for a six-plug-in Waves package) and offers quick, refreshingly simple tools that cleverly disguise complex underlying processing. Piano (Strings & Keys plug in) - Starting in bypass, switch in and then choose the 'piano' type and spin through the settings starting with EQ and compression, then onto space, doubler, presence and girth, listening in solo each time. Snare (Drums plug in) - Start in bypass, then switch in and select snare top type. Adjust gate, compressor and EQ. Then go through the 6 other processes in solo - attack, length, attitude, wood, presence and reverb. Finally balance all together. Shaker (Cymbals & Percussion plug in) - Start in bypass, then switch in and choose shaker type. Now adjust sensitivity, EQ and compression. Now go through the effects in solo - ambience, attitude, punch and tone. Blend them all together. Note the subtleties of the different effects. Electric Guitar DI (Guitars Plug In) - Start in bypass then switch in the clean type. Adjust sensitivity, EQ then compression. Now switch through the effects in solo - edge, warm, sustain, doubler, verb, attack and presence. Blend them back together with the main signal. Bypass to compare. Female Vocal (Vocals plug in) - Start in bypass then switch in the female vocal type. Set EQ, de-ess then compression. Now go through the effects in solo - magic, space, attack, attitude and presence. Blend together with main processed signal and bypass to compare.